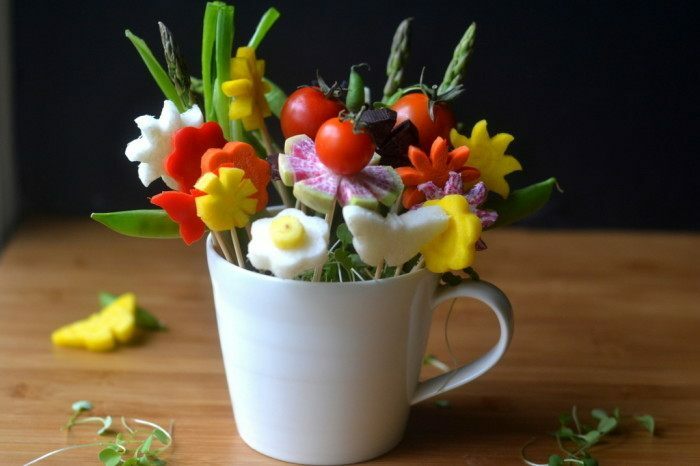 How to make fun edible bouquets out of colorful veggies for summer entertaining! Gather small round, flower, and butterfly cutters. Prepare some damp paper towels so you can keep your veggies moist as you work. Wash and peel the veggies that require peeling. As you work, put the cut veggies in the damp paper towels. When using small shape cutters, use firm pressure to get a nice clean cut. Gently nudge the shape out of the cutter so you don't break any of the small parts off. For carrots, slice the widest end into thin rounds and either cut with a small flower cutter, or cut divots out to make a flower shape. You can use the thinnest end to cut small slices that can be used for the center of other flowers. For the jicama, slice it and cut out flowers and or butterflies. Experiment with the perfect thickness for your cutters. Beets can be cut the same way, slice the widest part of the beet for the most surface area. Be sure to keep red beets away from the other veggies to avoid staining them. Slice the sides from bell peppers and remove any white part before cutting. Once your vegetables are cut you can start to create your flowers. Slide the end of a toothpick into the flower to make the stem. You can slide one or two pea pods on to serve as leaves on a few of the stems. Choose a vase for your bouquet and loosely fill the bottom half with sprouts or micro greens, letting some peek out of the top. Arrange your stems and add the asparagus, pea pods, or small lettuce leaves for greenery. Cut the toothpicks to different lengths to vary the height of each flower. A little water in the vase will help keep the greens fresh. Lightly spritz the whole bouquet with water.